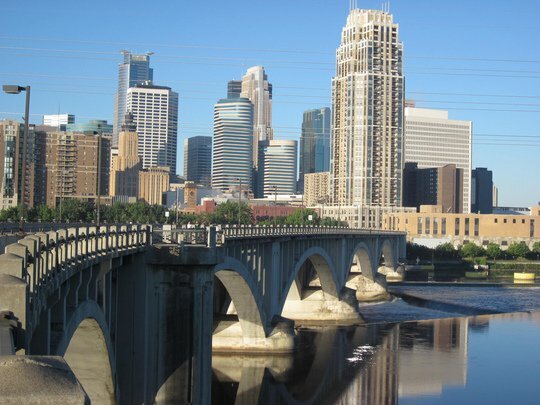 The largest city in Minnesota, Minneapolis is known for its culture, creativity and charm. Minneapolis is the perfect place to enjoy a night at the theater, take in a concert, or wander through a world-class art museum. The city is home to the Walker Art Center, the Minneapolis Institute of Arts, the Guthrie Theater, and legendary concert venue First Avenue. Many residents enjoy cheering on the Vikings, taking in a Twins game at Target Field, and enjoying the city’s beautiful numerous lakefront parks. In Minneapolis, apartment hunting starts in January, peaks in the late summer, and dwindles by September. Still, especially compared to some other cities, apartment hunting in Minneapolis remains a viable option year-round. Finding an apartment can be hard, especially when there are so many choices. Adding a filter can help narrow your search. With our Quick Filters below, you can search by a price and amenities. After following one of these links, be sure to check out the advanced search filters and then sign up for an Email Alert so you can receive new listings that match your needs. Compared to the rest of Minnesota, Minneapolis’s population density attracts larger, more professional management companies and property ownership groups. Expect to meet professional but friendly organizations when you shop around for your new apartment. The city of Minneapolis offers many diverse neighborhoods so you can discover one that suits your apartment needs. Minneapolis is situated on the Mississippi River and offers a variety of walking paths, parks and lakes for residents to enjoy. Finding a neighborhood that suits your lifestyle is crucial to feeling at home in Minneapolis. We’re here to help! No matter where your new apartment is, Minneapolis is an easy city to navigate. The city’s public transport system features of a large number of buses and two rail lines. The Blue Line runs from downtown Minneapolis to the southern suburbs, with stops at the Mall of America, Target Field, and the Minneapolis-St. Paul airport. The Green line runs 24/7 and connects Minneapolis to St. Paul. Specific routes and schedules can be found at www.metrotransit.org. And if your new apartment doesn’t include a parking spot, don’t fret. Parking is relatively easy throughout the city: There are ramps, metered parking areas, and residential streets that do not require parking permits. You can usually find a free spot, though accessibility can depend greatly on the specific area and the season. Parking can get difficult in the winter, when snow emergencies require cars to be off certain streets during certain hours. Uptown isn’t quite the same as when Prince immortalized it in song — fewer painters, more strollers — but many Minneapolis residents still frequent the neighborhood for its high-end dining and bustling nightlife. Especially on weekends. The area is also a great place to shop, with many local boutiques and one of the Midwest’s great independent bookstores, Magers and Quinn. The Warehouse District , or North Loop, is a former industrial area just northwest of downtown Minneapolis, along the Mississippi River. Its enormous buildings once housed milling and manufacturing goods, but they now play to host to luxury apartments, craft cocktail hangouts like Marvel Bar, shops from fellow Midwesterners Shinola Detroit, and some of the city’s best restaurants (Bachelor Farmer and Spoon and Stable). Minneapolis has a wide range of attractions to offer visitors and locals alike. Enjoy the wonders of the natural world at the 500-acre Minnesota Zoo or explore the SEA LIFE Minnesota Aquarium, which houses more than 10,000 species. If you're bored of exploring the city on foot, consider seeing the Twin Cities from a different perspective. The Foshay Tower offers stunning views of the city from its 30th floor observation deck. You can also hop in a kayak and take a Mississippi River tour, giving you a little side of fitness with your view. Minneapolis is home to a vibrant, forward-thinking foodie culture, inspired both by the city’s Scandinavian heritage and its diverse modern population. The reigning winner of the James Beard award for Best Chef in the Midwest, Paul Berglund, leads the kitchen in The North Loop’s Bachelor Farmer, and young chefs across Minneapolis have embraced a farm-to-table, hyper-local mentality. Expect to see the phrase “New Nordic cuisine” on plenty of menus and in restaurant reviews. The city’s great food isn’t limited solely to fine dining, though — you can get delectable dishes just about anywhere. Whether you're a U of M student grabbing a delectable pancake (and a side of surly service) at Al’s Breakfast or waiting in the lunch rush line for a face-sized bowl of pho at Quang, you're sure to find a favorite Minneapolis restaurant that you can't get enough of! Once you dive in to Minneapolis’s bar scene, you'll be hard pressed to find a more welcoming place for alcohol enthusiasts. Craft beer is practically a religion here, with Surly Brewing Company leading the way. The brewery is a destination in the area, offering liberal pours of its aggressively named beers (Furious, Hell, Bender) in decidedly chill surroundings. Summit, one of the Midwest’s first major craft breweries, also calls Minneapolis home. As for spirits… Minneapolis is also one of the few cities that allows distilleries to also open on-site bars. Check out Du Nord, Tattersall, or Wander North for some of the city’s best cocktails, shaken and stirred within feet of the still. Two birds, one stone. When it comes to culture, Minneapolis doesn't play. Visual arts lovers will find much to love, from the eclectic collection at U of M’s Weisman Art Museum to the contemporary exhibits at the Walker Art Center. Adjacent to the Walker is the Minneapolis Sculpture Garden. Run in partnership with the city parks department, it features 11 acres of green space and works of art by Sol LeWitt, Eva Rothschild, and Claes Oldenburg, whose Spoonbridge and Cherry is something of a Minneapolis landmark. If you're searching for something a little off the beaten path, take a look at the Museum of Russian Art – the only museum in the United States exclusively dedicated to exhibiting Russian work. Theater buffs can enjoy performances at the Guthrie Theater, Orpheum Theatre, and numerous other venues dotting the city. If you can't find a cultural event to attend in Minneapolis, you're not looking hard enough! Minneapolis keeps its residents busy year-round with fun events and unique festivals. Every third week of May, the Minneapolis Arts District comes alive as galleries open their doors to the public and welcome spring with a little touch of creativity. Rock the Garden, a summer music fest held outside of The Walker Art Center, has recently hosted The Flaming Lips, Chance the Rapper, and Belle & Sebastian. You can also enjoy free summer movies and concerts throughout the summer at Father Hennepin Park, the perfect setting for date night or a lovely outdoor picnic with friends. But Minneapolis's most unique event by far is the Minnesota Fringe Festival, an 11-day extravaganza celebrating the arts community and showcasing everything from expressive dance to visual art. Big fan of retail therapy? You've come to the right city. The shopping destinations in Minneapolis are fabulous, and clothes and shoes are tax-free! Plus, Minneapolis is home to The Mall of America, the country’s largest shopping center, with more than 4.3 miles of retail bliss. Southdale, the oldest indoor shopping mall in the nation, offers mid-range chains. For more local goods, head over to the Galleria, which boasts many upscale stores exclusive to Minnesota. Looking for something a little more obscure? Head over to the intersection of Selby and Snelling near St. Paul to browse through quirky boutiques and vintage shops, or take a look at 50th and France for more upscale retailers. Sports fans will find a lot to love in the Twin Cities. In addition to collegiate athletics, Minneapolis is host to four professional sports teams. Take in a Twins game at the Hubert H. Humphrey Metrodome, or watch the Vikings defend their NFC North title at the new U.S. Bank Stadium. For basketball and hockey games, head over to Target Center right in downtown — the resurgent Timberwolves have been particularly strong of late. The Minneapolis park system is regularly cited as one of the best in the nation. There are dozens of beautiful options, but locals frequently vote Minnehaha Park, Loring Park, and Edinborough Park as some of the best outdoor recreational spaces in the city. If you prefer your green spaces more manicured, the Lake Harriet Rose Garden in Lyndale Park or the Eloise Butler Wildflower Garden should give you plenty to enjoy. For something a little different, head over the Mississippi river just northeast of downtown to see St. Anthony's Falls — once the only major waterfall on the Upper Mississippi, and now the site of a series of locks and dams. Unlike many other cities, Minneapolis's outdoor spaces can be easily enjoyed beyond the summer months. Many local parks like Powderhorn and Van Cleve Park flood their baseball fields during winter, creating lovely ice rinks for skating and hockey.